Travelers - Commercial Auto Monoline | Special Feature | Coalition - Cyber Insurance | Webinars | TRIVIA! Travelers uses a credit-based Insurance Score to deliver more accurate pricing. It is one of many variables they consider when evaluating risk, including: vehicle type, motor vehicle records and accident history. Many insurance carriers already use credit-based insurance scores to price personal and commercial insurance policies. Travelers understands how important credit information is to customers and would like to provide more information about how it is used. What is Travelers Insurance Score? Travelers Insurance Score is a credit-based insurance score developed by Travelers. It's important to understand that it is not the same as a personal FICO® or even a D&B® business credit score, and that the credit information they use does not impact a customer's credit score. It simply ensures that Travelers can deliver the most accurate pricing possible on each commercial auto policy issued. A Travelers Insurance Score is calculated at the time of quoting and is not shared with any third parties. For companies with a D&B rating, the Travelers Insurance Score will also be one of the variables used to determine price. No additional sensitive personal information, such as a social security number, is required. Consent to access a personal credit report is required to obtain coverage. Without it, they can provide a premium estimate, but cannot finalize or issue a commercial auto policy - regardless of fleet size. Though not required, existing Travelers customers can choose to opt in to a credit-based insurance score at their next renewal. If you have any questions about Travelers or the Commercial Auto - Monoline product, please contact Big "I" Markets Commercial Underwriter Tom Spires at tom.spires@iiaba.net or Claire McCormack at claire.mccormack@iiaba.net. 1-Insurance scores are only used in states where the practice is permitted by law. Ever wonder what the President and CEO of your national association is doing on your behalf? 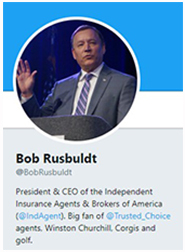 Follow IIABA leader Bob Rusbuldt on Twitter at @BobRusbuldt to stay up-to-date on a wide breadth of Big "I" initiatives. You'll see timely updates on government affairs and national endeavors such as Trusted Choice, but also big happenings on Big "I" Markets, like our obtaining E&S licenses nationally or offering you great new products to grow your business like Coalition Cyber. Recently Bob has tweeted about state association achievements, industry news, and must-read articles from IA magazine. Don't miss out! Follow Bob today to learn what our leader is doing every day on behalf of independent agents and our great industry! Great news from our Coalition cyber liability program that will make your life easier: surplus lines taxes and fees no longer need to be calculated! As highly requested by our members, Big "I" Markets worked with Coalition to automatically populate the applicable taxes and fees on the quotes, binders and policies. 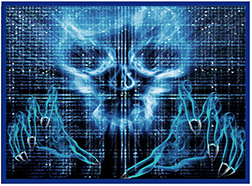 Cyber threats are scary! Don't spend your Halloween shaking over the fear that your agency has not offered a Cyber Liability quote to all commercial clients. Log in to Big "I" Markets today and request a quote or contact Carla McGee to discuss bulk quoting your commercial book. For a limited time, your agency can earn a bonus incentive on this product, too. Bind 25-150 Coalition cyber policies through Big "I" Markets by 1/01/2019 to receive the following bonus in addition to your standard commission! If you're new to quoting cyber, watch our brief How to Request a Coalition Cyber Quote video for an overview of the process. Get started today at www.bigimarkets.com! Bonuses will be calculated based on premium and paid in a lump sum by 1/31/2019. 1. The first movie of what comedy duo premiered on this day in 1940? 2. What are the three criteria needed to create a Travelers Insurance Score for Commercial Auto? 3. To which Big "I" state association did Bob Rusbuldt tweet congratulations on the occasion of its 125th anniversary? TB - Which Friends star had to prove he/she was not in England when a look-alike stole a case of beer? Congratulations to our agent in Ohio on a Bonds - Bid, Contractor, Performance, Surety sale of $44,329 in premium!